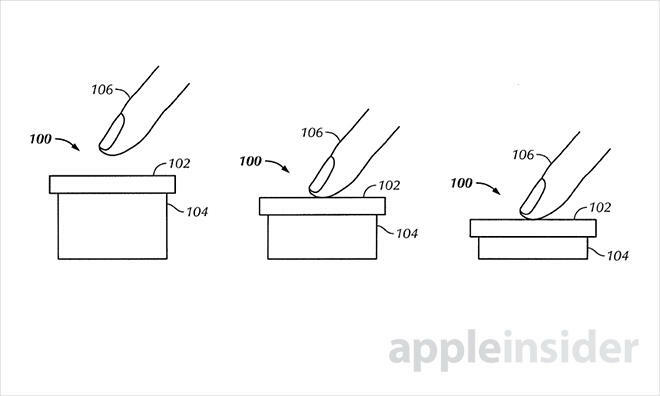 A patent discovered by Apple Insider is adding some credibility to a recent Bloomberg report claiming Apple was working on introducing enhanced touch sensor to future iPhones. Over the weekend, Bloomberg sources said the Cupertino company was developing touchscreen technology that was more receptive to different levels of pressure, possibly allowing Apple to trigger different UI functions. The patent specifically applies this method to physical buttons, but deep down Apple suggests the technology could also concern touchscreens. The above image kind of shows the method in action, with a touch-sensitive button with “multiple depression thresholds.” Once certain thresholds are reached, Apple will have the flexibility to activate specific functions. Apple Insider suggests the different thresholds could be used to control the entire iOS experience, such as turning a device on, opening an app like email, and replying to a message, all controlled by merely pressing the screen with varying pressures. This method also allows for energy savings. When the button is not actuated, the touch sensor can remain in a low-power, non-sensing state. Once the first threshold is reached, however, an input signal can be generated. In Bloomberg’s report, sources were hazy on when such technology would be implemented in Apple’s iPhone, warning that consumers might not see it until 2015 or later. The patent certainly sounds interesting, and can definitely change the way users interact with their devices. Apple patents are discovered all the time, but it doesn’t mean they’ll actually be used in future devices. With such potential for greater functionality, however, it seems Apple is particularly interested in a pressure-sensitive touchscreen.